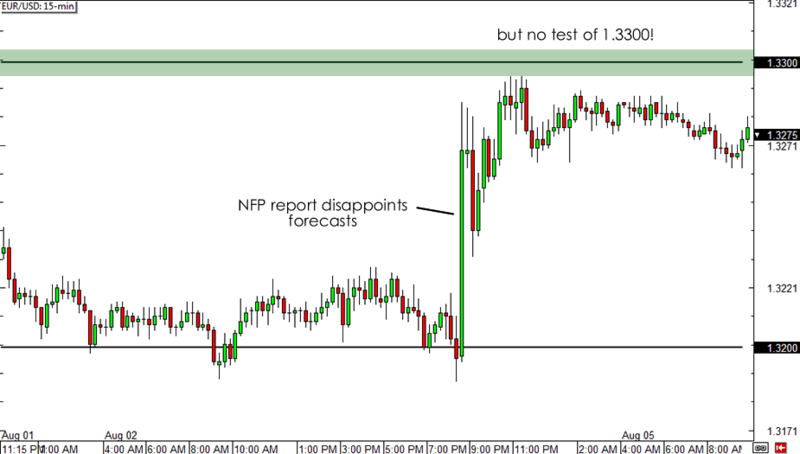 July NFP Disappoints! What Now? What a party pooper! Just when it seemed like the U.S. jobs market was on a roll, the July NFP turned out to be a disappointment. Analysts had high hopes for this release, as hiring was expected to increase by 184,000 for the month, following the 195,000 rise in employment initially reported for June. Not only did the actual figure for July miss expectations when it printed at 162,000, but the previous month’s reading was revised down to just 188,000. Average hourly earnings also disappointed, as it showed a 0.1% decline instead of the estimated 0.2% uptick. The good news though, is that the jobless rate fell a couple of notches from 7.6% to 7.4% while average hourly earnings are still up by 1.9% for the year. So, did the U.S. jobs market improve or not? A closer look at the components of the NFP report should give us a better idea of how the labor market fared in July. As it turns out, most of the jobs added last month were just part-time ones. Full-time hiring picked up by 92,000 while part-time employment increased by nearly twice as much at 174,000. One reason that could explain this is the passing of the Affordable Care Act, which would impose penalties on employers that don’t provide health insurance to its full-time staff. With that, firms probably opted to put workers on part-time status or scale back working hours. Hiring in the private sector fell short of expectations, as employment in this area rose by only 161,000 instead of the estimated 195,000. In addition, the services sector accounted for most of the increase in hiring while the construction industry showed a decline. Meanwhile, there was barely any change to the number of government employees for the month. Perhaps the brightest spot that came along with the report was the downtick in the unemployment rate. The 7.4% reading is actually the lowest figure we’ve seen in four and a half years! Mind you, this also brings the Fed closer to its 6.5% unemployment rate target. A few market junkies argue that the 0.2% downtick from June’s 7.6% reading was the reason why the dollar’s sell-off wasn’t sustained. As you can see, the rise in EUR/USD was pretty limited. Heck, it didn’t even test the 1.3300 handle! In my opinion, there are two main takeaways from the report. One, although it is far from spectacular, the employment data for July still signals that the U.S. is on the right track of recovery. Secondly, the mixed figures only make the Fed‘s decision of whether or not to taper asset purchases next month all the more difficult! On one hand, we saw stronger economic growth in Q2 2013 and a lower unemployment rate (which the Fed uses as a basis for its economic assessment). But on the other, we have weaker payrolls. What do you think? Will the disappointing headline figure convince the Fed to hold off tapering? Or will the drop in the unemployment rate be enough for them to go ahead with it? Will the most recent NFP report be enough for the Fed to push through with tapering?